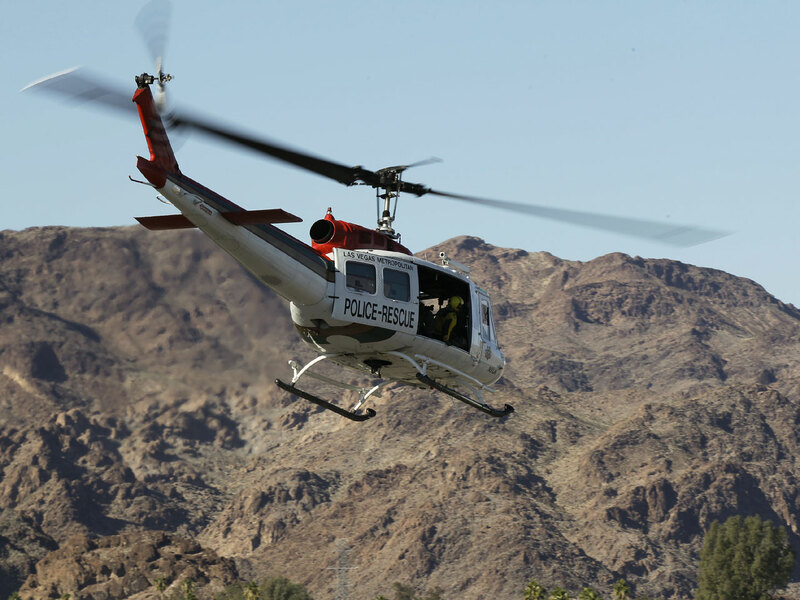 A federal crash investigator said Friday that a Las Vegas tour helicopter that crashed, killing all five people aboard, made a sudden climb and sharp turns moments before plunging into a canyon near Lake Mead. National Transportation Safety Board member Mark Rosekind said he could not draw conclusions about the cause of the Wednesday crash from the erratic flight pattern and said the investigation would continue. "Up to the last minute, it was all standard tour operating procedure," Rosekind said. "At the last minute, things changed. Why? We don't know," he said. Rosekind said the fatal flight was the fourth for the aircraft after it underwent routine maintenance Tuesday to replace the engine and mechanical actuators in the tail and main rotor. An initial engine examination at the scene found the engine was producing power at the time of impact, and Rosekind said all the mechanical control devices, called servo-actuators, were removed from the wreckage Friday to be examined. Authorities removed bodies from the crash site Thursday but didn't immediately release the names of the five people who died in the fiery crash of the AS350BS helicopter operated by Sundance Helicopters of Las Vegas. Clark County Coroner Michael Murphy said he cannot release the names of any victims because bodies have not been fully identified, a process that will likely involve the use of DNA, fingerprint and dental records. Family members have identified three of the dead as the pilot, Landon Nield, 31, of Las Vegas, and Delwin and Tamara Chapman, both 49, a couple from Utica, Kan., who were celebrating their 25th wedding anniversary. Murphy said Friday the other two victims were a couple from New Delhi, India. Though official identification was pending, friends and family members in several states mourned the dead. Delwin Chapman ran a construction company and served on the City Council. Tamara Chapman recently closed her hairstyling shop in the city of about 160 people, said Ron Solze, whose son is married to one of the Chapmans' four daughters. "Both Delwin and Tammy just did so much with the community," said Marilyn Johnson, who traced her friendship with Tammy Chapman to Utica High School in the late 1970s. "They were always helping." Johnson said Friday that Tammy Chapman was diagnosed with multiple sclerosis a couple of years ago and worked as a hairdresser until recently. "She struggled," Johnson said. "She was in pain a lot of times. But she seemed to be doing better." Delwin Chapman's first wife, Linda Horn, of Wichita, Kan., said the two daughters they had together were "completely devastated" by the loss of their father. "It's just tragic," Horn told The Associated Press. "It's really just sinking in little by little. He was a really good family man, a really good father." Johnson said she thought residents from far and wide would attend the couple's funeral services, which were not yet scheduled. "It'll be a big service," she said. "They were just wonderful people." The NTSB's Rosekind said most of the aircraft was consumed by fire, but investigators expected to be able to retrieve crucial pieces, including rotors and the engine. Rosekind said a preliminary report would be released by Dec. 20, but a final report with safety recommendations could take up to a year. Rosekind said investigators were reviewing pilot, aircraft and maintenance records and wouldn't speculate what might have caused the aircraft to go down about sunset in rugged and rocky mountains between Las Vegas and Lake Mead, about 12 miles west of McCarran International Airport. Sundance CEO Larry Pietropaolo said there was no distress call before the chopper's GPS signal stopped during the typical 40-minute twilight flight over Hoover Dam and the Lake Mead reservoir on the Colorado River, the western rim of the Grand Canyon and the neon-lit Las Vegas Strip. Weather did not appear to be a factor. Skies were clear with mild winds about 5 mph and temperatures about 29. Rosekind said Friday that four witnesses have come forward to report seeing and hearing the helicopter, which crashed and burned near the bottom of a narrow V-shaped canyon about 150 feet deep. Investigators didn't know if there was a "black box" data recorder aboard the aircraft, which was built in 1989. The crash raised safety questions and focused attention on a tour helicopter company that has had at least five accidents and was the subject of 10 federal enforcement actions since 1994. The Federal Aviation Administration said most of the latter were for minor infractions. Pietropaolo has headed Sundance for 3 1/2 years. He said he believed the company had an excellent safety record. Clark County Department of Aviation records show that Sundance flew more than 167,000 passengers during the first 10 months of this year  nearly 17,000 per month. Nield was hired by Sundance nearly three years ago. Pietropaolo called him a solid pilot and a "very nice young man." Nield was one of 14 children in a Mormon family that lived in Wyoming and Utah. He had no history of accidents or violations, according to the FAA. A devout Mormon and the father of two, Nield flew for about seven years and married in June in a Las Vegas church. His sister, Angalena Adams, 23, said family was gathering Friday at her home in Cedar City, Utah. She said memorial services were not yet scheduled.